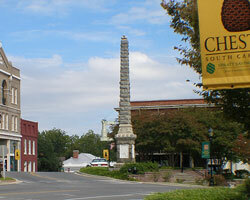 Chester, South Carolina's Pretty Little City on the Hill, is the county seat and the largest municipality in Chester County. The Chester Historical District encompasses 250 acres, including the City's revitalized downtown Hill District, and boasts some 475 different properties in a number of architectural styles with original Victorian-era facades carefully preserved. Many local organizations and merchants have spearheaded several downtown beautification projects, including a city-sponsored $1.8 million streetscape project completed in 1996, bringing visitors from other towns and cities to gain ideas and input on downtown revitalization. Chester County School District has approximately 6,200 students and 750 employees within three attendance areas Chester, Lewisville and Great Falls and offers modern facilities with small class sizes. In addition to being the area leader in the number of National Board Certified teachers, more than half of the teachers in Chester County have a Masters Degree or higher education. Several pre-Kindergarten through 12 Grade private schools are also available and located throughout Chester County. York Technical College is currently constructing a new 52,000 square foot facility at a cost of $8.5M. The 40-acre satellite branch will be located on SC 9 just east of Chester. Chester, with its small Southern town ambience and close proximity to Charlotte, NC, provides a desirable friendly lifestyle with affordable real estate prices, less daily stress and low crime rates. The Chester County area offers a varied choice for housing, from historic homes to farms or private deed-restricted lakeside subdivisions. Along tree-lined streets, Chester's Historic District offers homes dating from 1835 with styles including Queen Anne Victorian, Classical Revival, Craftsman Bungalow, Federal-Colonial, Greek and Italianate Revival. Chester Regional Medical Center, an affiliate of Health Management Associates, is a full-service acute care hospital and long-term care center encompassing 82 acute care beds, 100 long-term beds, a 12-suite day hospital, an emergency room staffed 24-hours per day, and a new surgical wing. The facility recently underwent a $15 million renovation. Emergency Medical Service and ambulance substations are located in several areas of the County. Chester residents always welcome new volunteers and members into the many community groups, organization and events. Cultural activities are fostered by such organizations as the Arts Council of Chester County, the Chester Little Theatre, the Chester County Library, the Chester Historical Society and local historical and civic groups. Annual festivals draw large numbers both locally and from out of state. In the fall, the City of Chester hosts the Chester Downtown Development Associations HILLarity Festival. This multi-cultural event features a wide variety of entertainment, crafts and food. Lily Fest, a celebration of the rare Rocky Shoals Spider Lilies is held in May at Landsford Canal State Park. Annual Spring and Christmas Tour of Homes events offer an opportunity to really appreciate some of the most impressive homes in Chester.